My name is Ansori. I was a child when my family fled Iraq because of Saddam Hussein’s regime’s brutality, many of them couldn’t and got killed. All my family including children and women were sentenced to death because they were considered as members of the opposition party. I was raised in Syria in a refugee camp. My father tried his best to give us a normal life. I started attending biology science at Damascus University, unfortunately I couldn’t finish my studying as the civil war started. In 2011 ISIS took over the camp and destroyed my home and again, we had to run away, we didn’t lose anything because we had nothing, we never did. My hero Mohammad Hawydi was burned to death by ISIS, that day I lost everything, my soul, my sun and my smile. 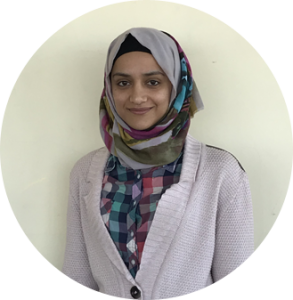 I lost my language but I found my pen…..
Ansari will be developing her writing over the next 12 months and looking forward to publishing and reading some of her work, as well as creating a special commissioned poetry film. She will also be closely mentored during that time to help her create her own workshop based arts project that will target refugee communities across London. Her mother helped her to wear the new uniform. The classroom was full of children! New friends! Like her, they wear the same uniform. Copying other children, she said “Good morning” to everyone. She was like them. She was one of them. “Why you Shia kill yourselves in Ashura?” the teacher asked her. All the children’s eyes are fixed on her. Speechless and helpless she stood there, unable to think, unable to blink. She was not one of them, and will never be. She is crying so hard that her tears turn into blood. No one knows what she has lost to rent that cursed DVD. Now she wants to die. They have lost the only piece of paper, which proves she has a face, a heart and a name; the only paper that proves her existence. Now she does not exist. No one is going to forgive her, not even God. Their anxious eyes are fixed on the clock. They stepped with dirty shoes where her father prays, on the rug her mother cleaned two days ago. As they shouted at her family, she swallowed her helpless anger while her mother squeezed her hand in a warning sign. They do not care if their disgraceful behavior terrifies her 5-year-old sister or humiliates her 70-year-old grandfather. They never did. Her brother told them he is a doctor, but they laugh as if it was a joke. Every year they cleanse the camps searching for undocumented families. They come with their military uniforms, heavy shoes and aggressive behavior to spread the horror through the houses. Money is the only language they speak. Her brother does not understand it. Her father speaks it fluently. In my country, they are suicide bombs.